"You like to read? You should read my neighbor's books!" I was a newcomer to Lincoln, Nebraska, helping with a church chili supper when those words introduced me to Bess Streeter Aldrich, who was to become my favorite storyteller. "Who's your neighbor?" I asked. "Her name was Bess Streeter Aldrich, and I just know you'll love her stories." And I did. 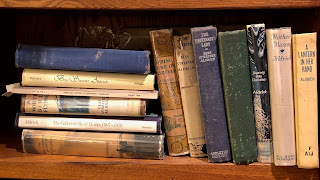 Personal favorites among her nine novels include Mother Mason (about a young mother just looking to escape for a day), The Cutters (about a young family), Miss Bishop (about a single school teacher who models the concept of servanthood), and A Lantern in Her Hand (about pioneers making a home). Little did I know at the time I first heard her name that Mrs. Aldrich's life would become a personal encouragement to me. Her four children ranged in age from 4 to 16 when Mrs. Aldrich's husband died suddenly. She'd been writing since childhood, but with the death of her husband, writing became the means of support for the family. My four children ranged in age from 12 to 21 when my husband died. I'd been writing since childhood as well, but Bob's death meant that writing had to become a means of support for our family. I was truly encouraged in that venture by Mrs. Aldrich's example. 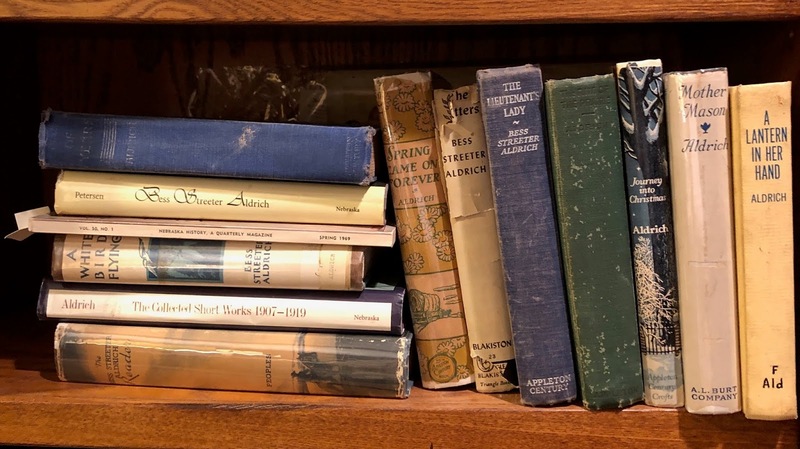 Stephanie's shelf of Aldrich books. "Why quarrel with a writer over realism and idealism? After all, an author is a glass through which a picture of life is projected ... If one writer does not see life in terms of dirt and grime and debaucheries, it is no sign that those sordid things do not exist. If another does not see life in terms of faith and love, courage and good deeds, it does not follow that those characteristics do not exist ... I claim that one may portray some of the decent things about him and reserve the privilege to call that real life too." 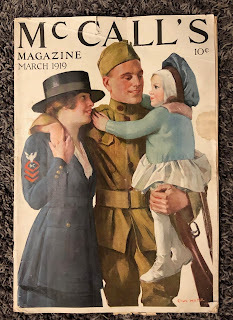 Magazine featuring an Aldrich story. Born in 1881 in Cedar Falls, Iowa, Bess Streeter married Charles Aldrich in 1907. 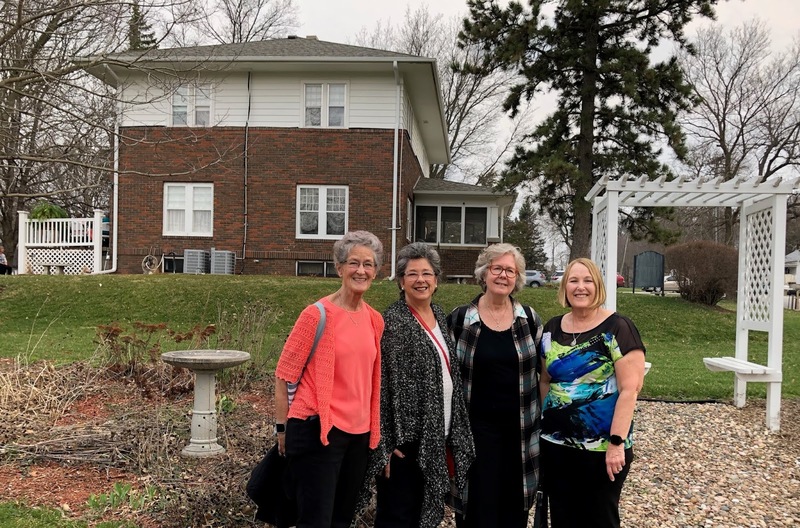 The couple moved to Elmwood, Nebraska, in 1909 with Bess's sister and brother-in-law with whom they had partnered to purchase the small town bank. Bess had won writing contests as a teenager and when, in 1911, she saw notice of a writing contest in a Ladies Home Journal magazine, she entered the contest. Her story was one of six selected from over 2,000 entries. From then on, Aldrich wrote whenever she could. 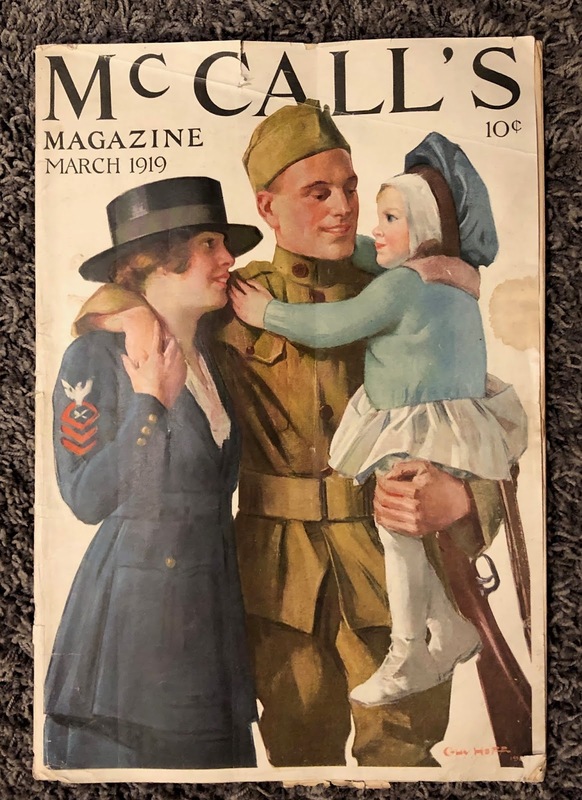 Her first novel, Mother Mason, published in 1924, was actually a compilation of stories that were beloved by WW I soldiers because they reminded "the boys" of home and mother. Aldrich became one of the best paid magazine writers of her time. In her 40-plus-year career as a writer, she authored 160 short stories and articles and nine novels. visiting this lovely home to view historical garments on display throughout the two-story home and then to attend a banquet and enjoy a presentation by Yesterday's Lady of Beatrice, Nebraska, as she shared how historical events impacted women's fashion. 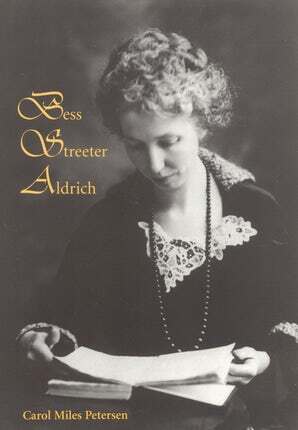 If you haven't read Bess Streeter Aldrich ... you're in for a treat! Aldrich takes readers back in time, affirms the older generation, and offers "models of grandparents, spouses, offspring, and siblings." 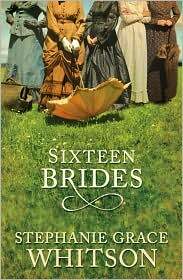 When sixteen women step off the train in Plum Grove, Nebraska, they are met with the reality that the man who promised them "prime homesteads" in Nebraska was really scheming to deliver mail order brides to lonely homesteaders. Five courageous women refuse the arrangement and band together, risking everything to realize the dream of owning land in their own names. I will definitely have to look her up! Thank you!